When the whole world is going hybrid then why India should be left behind from that heated trend, so to make the things better here Toyota is studying hybrid-possibility for our local market. To an extent, the well renowned Prius hybrid exists on our Indian shores, and is being a due for an increment to the existing range of automaker’s specified range, who now had vowed “more” lined-up for this particular segment of global market, which can be termed as a plan to sell 1 million newly launched hybrid models till 2015. As learnt, Toyota had 18 hybrid models in the pipeline meant to be rolled out till 2015, out of which 5 are the re-modeled version of present makes. Getting into the sneak peek, Toyota Motor Corporation (TMC) had crossed sales figure of 50 lakh hybrid vehicles on 31st March 2013, as calculating the numbers since 1997, the time when this Japanese carmaker had launched its first hybrid in world, present total accumulates out of 19 hybrid models and a one plug-in being sold across 80 countries; whereas the Prius in India too had witnessed an increment of 70% i.e. to 12 units in 2012-13 from 7 units in the last financial year. One can say that, high pricing is the sole pinching factor behind low sales of Prius, slated to be an outcome of the CBU route which makes the selling cost high, as burgeoned with lumps of high taxes and duties on the fully build cars unlikely to only handful of overheads in CKD route. Well the officials had declined to comment frugally on the possibility of adopting that latter option in India, as they say, “Depending on the future market dynamics, we will study and take a decision accordingly.” Toyota also had not inclined any time frame for same, so we can say that the plans are still on shaky grounds, needs to be worked out properly on behalf of Indian context. Lastly, for claiming the top line of Prius, Toyota had priced it in between Rs 29.26 lakh and Rs 31.43 lakh (ex-showroom, Delhi). Toyota Motors launched the latest upgraded variant of its Prius recently, at the platform provided by the 2012 Delhi Auto Expo. The car is globally recognized as the pioneer and the market leader in bringing about new developments in Hybrid technology. Another noble endeavor by Toyota in its mission of serving the society has been the launching of its “Easy Seat”, which is a swiveling seat that has been customized to address the mobility needs of ‘special’ people. It is expected that the latest Toyota Prius is expected to be kept at a price range between Rs.27.39 Lakh to Rs.29.41 Lakh. This is the third generation of the Prius in the Indian auto market, which had been initially introduced in the Indian auto market in 2010. 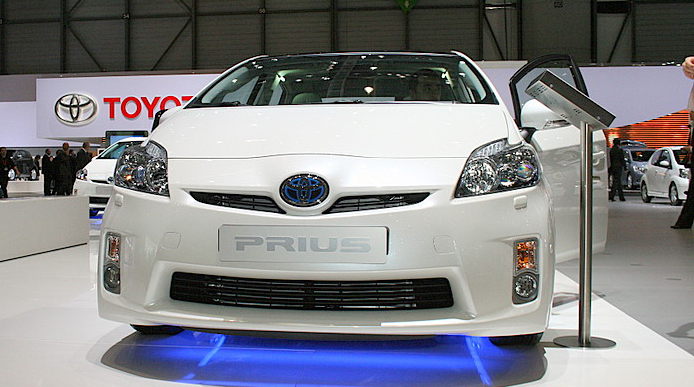 Hybrid technology has been the core focus of Prius and it is the first hybrid vehicle to be mass produced. 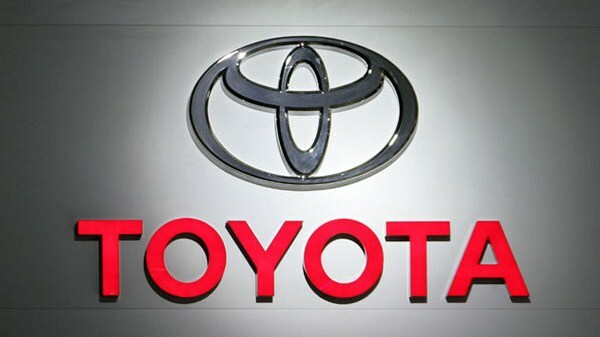 Not only has the Toyota Prius been capable of delivering benchmark levels in terms of fuel efficiency as well as lower emission of carbon, the car has also revolutionized the auto market in numerous ways through its high technological design along with the power packed driving performance it offers. This has led to the car being acclaimed greatly across the globe. The Toyota Prius has always been much ahead of other contemporary cars by not only anticipating, but also answering the special needs of the environment. It has been acclaimed as a car that has been able to set a future benchmark. The car has been built on the basis of the trend setting technological features that has been acclaimed across the automotive world. The current model also comes with another incredible feature of Solar Ventilation. The Prius’ moon roof comes with an integrated solar panel that is able to generate electricity that is able to ventilate the cabin even when the car has been kept parked. The Remote controlled Air Conditioner that the car has allows the users to operate the air conditioner even before stepping into the car. Thus, the cabin temperature is perfectly in tune with your requirements, even when you have just entered the car. Innovation in design is seen in its front bumper and grille. The Prius also comes with new turn-on indicator having OVRM Retract, headlamps, along with new design of its alloy caps and its LED Tail Lights. The car has been provided with a latest Audio system that is equipped with JBL 8 speakers. It also has a Back Monitor and an USB port. In the words of a leading authority of the company, the Toyota Prius has been an endeavor by the auto maker to provide the Indian market with an advanced hybrid technology in the automotive sector. The vehicle aims to encourage other manufacturers to participate in this segment, as far as the Indian auto market is concerned. The main aim of all the technological features that the car has been provided with is in lines with the commitment of the car maker towards a greener environment along with all the necessary convenience features that is going to be received by the consumers. Toyota Motors has always been committed towards serving the society and has been recognized as a pioneer in offering a lot of customer oriented features. This has also been the core philosophy behind designing the ‘Easy Seat’, which is an accessory recommended by TKM. This is a swiveling seat that has been customized to address transport related issues particularly for people, who are impaired with mobility issues. 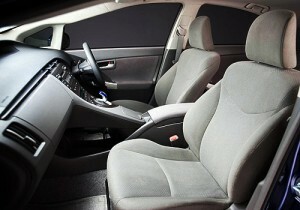 The Toyota Corolla Altis will be provided with this Easy Seat as a special fitment. This seat is going to cater to a vast segment of people and particularly the mobility needs of ‘special’ people, who can use these vehicles comfortably from now on. This Easy Seat is provided with a mechanism, which allows sliding and swiveling of the seat. The seat is user-friendly and can be easily turned and slid, therefore people having special mobility requirements can easily enter and exit the car. This has been specially recommended for people having medical ailments including arthritis and knee problems. 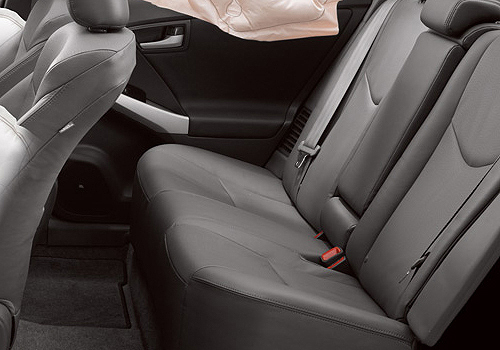 The seat has received the certification of ARAI and conforms to all industry set safety norms. It is a recommended accessory from Toyota. Toyota has kept the pricing of this Easy Seat at Rs.29,979 and the product has been offered with a warranty of one year. Authorities of the car maker have said that the Easy Seat has been solely designed as part of the global policy of the car maker to provide effective travel solutions for all sections of its customers and is going to enhance their experience about Toyota cars. Its unusual to compare things which cant be measured with the same yardstick, but while comparing things, we usually take the price factor first. If both the things, even if they are different, happen to be in the same price bracket, then they can definitely be put under the comparison scanner. The certain things turn out to be the Toyota Prius and the Honda Civic Hybrid. We recently had the Honda Civic Hybrid with us for approximately half a day and hence the quick comparison with its so called nearest competitor, the Prius. Now, having a Prius can be a sub Rs 30 lakhs affair while a Honda Civic, when new costs around Rs 25 lakhs plus on-road. So, back to back driving of the Honda Civic Hybrid is inevitable. Comparing apples to apples is what the norm is usually but we are going by comparing apples with bananas with the common thing being the nutrition quotient in them. This one is a no-brainer since the Toyota Prius in India is a unique one as far as the Civic Hybrid is concerned. Both these Japanese cars have always being known to be radical in their design thought right from the start. Admittedly since the time of the Toyota Fortuner, there are only a few Toyota cars that can turn heads in India, the Prius is a welcome change. Its afterall a sedan and a sedan turning heads is a big thing. This same thing used to happen when the Civic was launched albeit in its regular form. Some of the punks out there would insist that the it’s the Civic which stands its ground better. Though the alloys in the Prius wouldn’t make one to go wow, the ones in the Civic wouldn’t either. But admittedly so, the Civic’s alloys feel a bit special than the ones on the Prius. The length of the Civic admittedly is more than that of the Kammback Prius. The Prius gets the more funky looking rear end while the one in the Civic and its petrol fuelled cousin is the same save for the Hybrid badge. For us, it’s the Toyota Prius on the styling front, however, want a conventional thing, the Civic stands up. The Civic’s funky speedometer and almost head up display still have many fans. Everytime the door is opened, it calls for a sense of occasion. 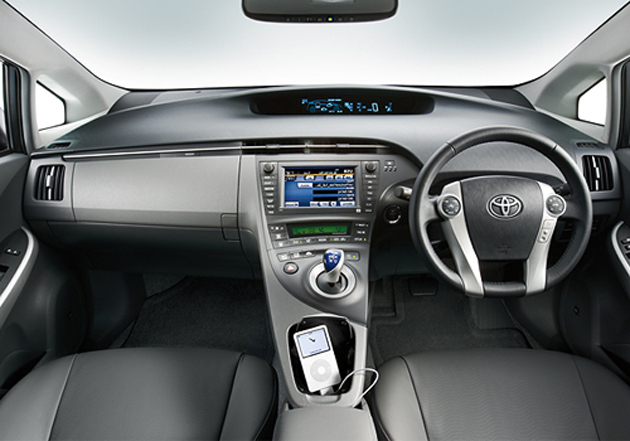 However, one look at the interiors of the Prius and you would be forgotten to having visited Edison’s lab. There is no typical instrument panel out here but then the various battery things and stuff. More like the “Hollow Man” lab. BMW style gear levers is an added bonus on a car without the Bavarian’s badge on it. The fonts at first seem hard to read, however, once we settled in the car for a good 5 minutes, everything seemed to work as it should. Seating in both the cars is quite comfortable, however the Prius has got the edge here with its higher seating arrangement wherein the occupants wouldn’t have to be on their knees literally to get inside. For older people, the ingress egress thing is what matters a lot. In the back, it’s the Civic which claws its way ahead. The flat seating of the Civic ensures that 3 people are more comfortable here than the made for two Prius. As for the boot space, the Prius just inches ahead of the Civic here. But the loading bay of the Civic is much lower than that of the Prius. In term of practicality, the Civic inches forward while for the novelty and bragging rights thing, the Prius is better. The ride quality of the Honda Civic and its typical behavior was duly noted in here however, compared to the stiff ride quality of the Prius, it was far more cosseting. The Prius doesn’t bottom out when fully loaded while the Civic does. Apart from that, speed breakers didn’t pose a problem for the Prius whereas for the Civic, one has to be real careful. The steering wheel of the Civic is more on the lighter side while the one in the Prius is heavier but simply doesn’t offer much feel to it. The steering response of the Civic was found to be more linear in comparison with the one on the Prius. The Toyota Prius is an absolute silent car. More to do with the thing that the petrol motor interference is far less in some modes. 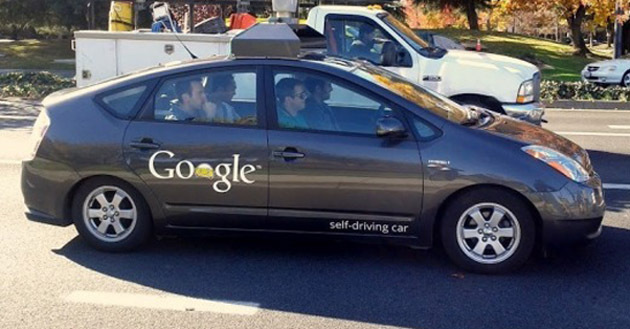 The electric propulsion that this car undergoes is very silent in nature and most of the times pedestrians are caught unawares by the presence of this car. Road noise is also less in this. 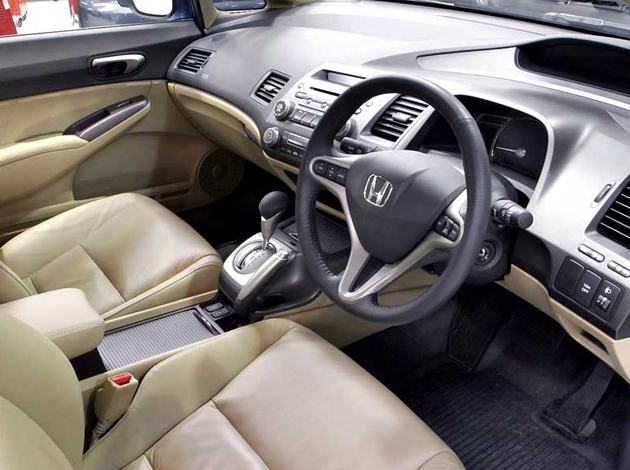 The Civic for the initial part remains silent but then on the motor becomes vocal enough. As for the handling part, it’s the Civic which can be said as a fun to drive in this context vehicle. The Prius is for simple motoring from point A to point B. Overall, it would be the Civic here but the Prius is eerily silent. About the engine parameters of both the cars, the details are provided here Toyota Prius in India – silence personified and for the Honda Civic Hybrid in India. 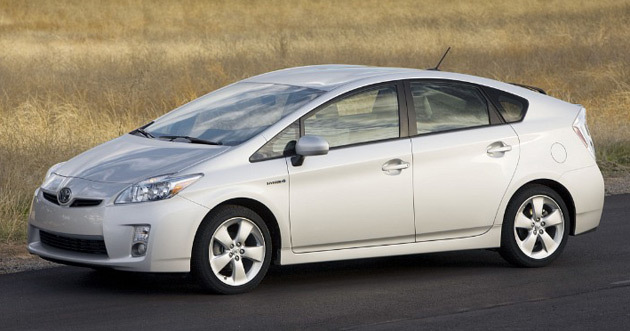 Like the Corolla, the Prius also boasts of having a 1.8 liter motor but in a detuned state. The Civic uses the 1.8 liter engine in the petrol Civic but the capacity has been lowered down to 1.3 liter now. In terms of power output, it is the Prius which outdoes the Civic. But while driving, the Civic seems more powerful of the two. The Civic boasts of having a very good braking setup and the ones in the Toyota seem as if the brake pads have worn out or something. The feel from the discs in the front is not upto the mark. Both the cars come equipped with braking safety aids. The safety factor is a bit more in the Prius than in the Civic hybrid. As for the fuel efficiency, the Prius clearly outshadows the Civic here. 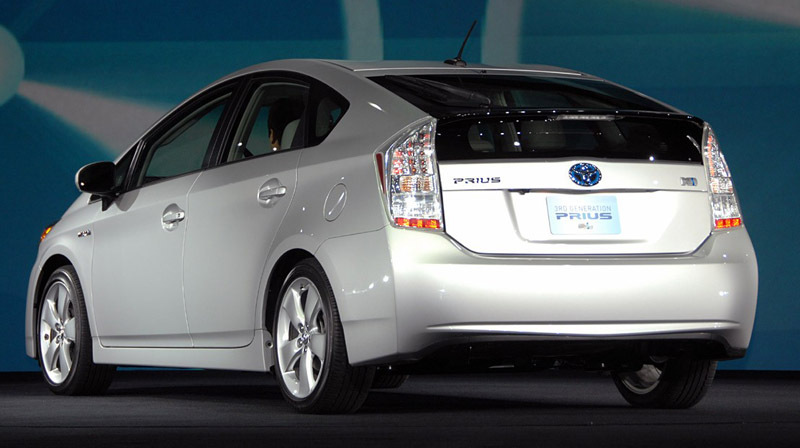 The Prius returned an overall fuel efficiency of 23.2 kmpl whereas the Civic hybrid turned in only 13.7 kmpl. Now, that a stark difference between the two. We would happily go for the Prius on this one. Though the Civic and Prius are from a different breed altogether, there is one bond which ties both of them and it is the use of an electric motor. Now, that’s the only strap and probably the “small” price difference between them both. If at all, you want a clean car, it would be the Prius. Novelty factor and fuel efficiency dialed in plenty. The Civic Hybrid is no longer available off the shelf and maybe Honda India may think of bringing it back if one is interested in it and push the show room people too far. The Toyota Prius price in India is Rs 27 lakhs while the Honda Civic Hybrid price in India revolved around the Rs 23 lakhs mark when it was first launched.